Breathless and painstakingly researched, this is a stunning debut mystery in which Sherlock Holmes unmasks Jack the Ripper. Lyndsay Faye perfectly captures all the color and syntax of Conan Doyle’s distinctive 19th-century London. In Dust and Shadow, Sherlock Holmes hunts down Jack the Ripper—the world’s first serial killer—with impeccably accurate historical detail and without the advantage of modern forensics or profiling. 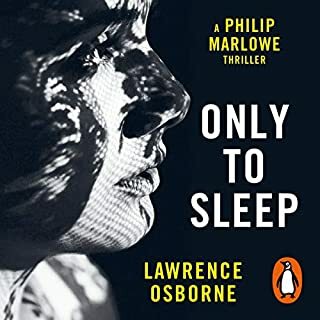 Sherlock’s desire to stop the killer who is terrifying the East End of London is unwavering from the start, and in an effort to do so he hires an “unfortunate” known as Mary Ann Monk, the friend of a fellow streetwalker who was one of the Ripper’s earliest victims. However, when Holmes himself is wounded in Whitechapel attempting to catch the villain and a series of articles in the popular press question his role in the crimes, he must use all his resources in a desperate race to find the man known as “The Knife” before it is too late. Penned as a pastiche by the loyal and courageous Dr. Watson, this debut signals the arrival of a tremendous talent in the mystery and historical fiction genres. ©2009 Lyndsay Faye (P)2010 Blackstone Audio, Inc. I have always enjoyed the original Sherlock Holmes stories. The pastiches not so much. Usually the author goes overboard to be faithful or makes the story ridiculous trying for laughs. I am not a Holmes purist, Basil Rathbone is still my favorite Holmes, regardless of the movie plots. This book was excellent! The Holmes character has some of the edges smoothed yet not so one wouldn't recognize him. Watson is thoughtful and decisive. The Lestrade character is perfect, though this one might be the one least like the stories. The crime to be solved is one of the most well known in history. There is plenty of tension as Holmes comes up with a very plausible solution. I loved this audio book. It was a perfect example in the tradition of Sherlock Holmes. Certain facts of the Ripper killings were blended seamlessly in a Sherlock Holmes style novel. Simon Vance as narrator was superb. He sounded like Sherlock, and like Dr. Watson and didn't do bad women's voices. Great regional accents. You won't regret listening to this...you will think you are listening to Sherlock and Dr. Watson in person. 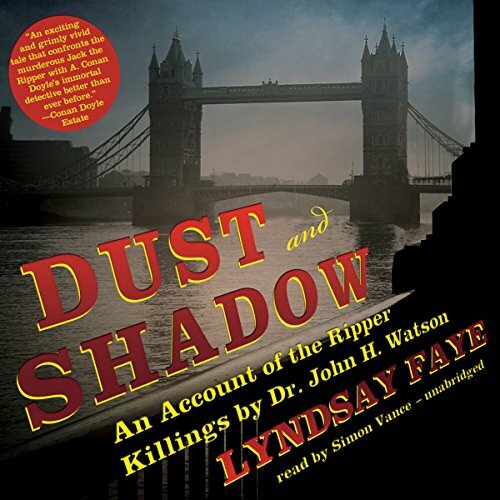 Dust and Shadow by Lyndsay Faye was an absorbing and entertaining (and frighteningly disturbing) listen. Faye does an excellent job of channeling Sir Arthur Conan Doyle, so that I usually had the illusion that I was listening to some apocryphal actual Holmes story rather than to a 21st century pastiche. The relationship between Watson and Holmes is depicted accurately, humorously, and movingly. The case, that of the Jack the Ripper murders in 1888 London, is relentlessly horrible, ultimately making us look uncomfortably into the dark human heart. I’m no Ripperologist, but having read Alan Moore’s graphic novel From Hell, it seems to me that Faye effectively matches up the historical case with the fictional detective. Faye is also quite good at evoking the slums of London in all their foul and brutalizing misery: dingy tenements, opium dens, slaughterhouses, public houses, and poor houses; fruit sellers, cat meat men, police, prostitutes—and a serial killer. 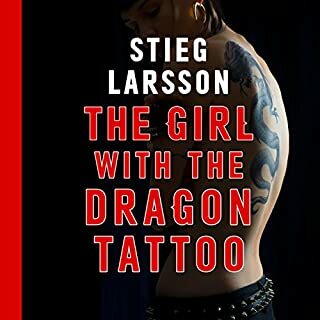 Simon Vance is his usual effortless and professional self reading the novel, changing his voice just enough to distinguish between the various characters without distracting the listener from the story, perfectly enhancing the text. There are a few flaws (in my mind) in the novel. The Holmes of my experience would figure out the culprit’s profession sooner than I did, wouldn’t break someone’s nose in a fit of pique, and wouldn’t say “Now get the hell out of here!” And the climax, while utterly gripping, is unconvincing after the fact. But overall I really enjoyed Dust and Shadow, and am sure it would appeal to any fan of Sherlock Holmes or Jack the Ripper. I think this listen would please both Holmes traditionalists (because it honours Conan Doyle's style, characterization and voice) as well as those of us who prefer contemporary re-imaginings of the Holmes' character (her prose is more snappy; she inserts more contemporary psychology, but not in an anachronistic fashion). Like Conan Doyle, the author paints the streets of London so vividly that they almost become a character. The dialogue is brisk and often humourous; Watson is an intelligent friend, not a buffoon. I had avoided the listen because novels using the Ripper murders can be grisly, but this, while "anatomically correct," avoids sensationalism. The story turns a bit Hollywood towards the end, however, so to me it falls short of 5 star historical detective ficiton. It is inevitable that writers feel a deep-seated urge to pit Sherlock Holmes against Jack the Ripper. The murders happened in the midst of Holmes's career; his contemporary readership must have wished he could step out of the pages and hunt down their nightmare for them. So it's no surprise that this is not the first time the idea has been pursued; there have been a couple of films (Murder by Decree with Christopher Plummer and James Mason as Holmes and Watson, and A Study in Terror), a handful of other books (including Michael Dibdin's The Last Sherlock Holmes Story), and a video game. This was my first foray into the mashup. I really enjoyed this Holmes story. Considering the timeframe of the story, its premise is quite believable (if you allow yourself to believe that Sherlock Holmes actually existed)... Narrator did a stellar job. Lyndsay, I'm a dedicated fan now. Please write many more Holmes stories. Keep them reasonbly believable. Pure pleasure for mystery lovers! This well researched, well written story was so good that I could hardly turn it off. 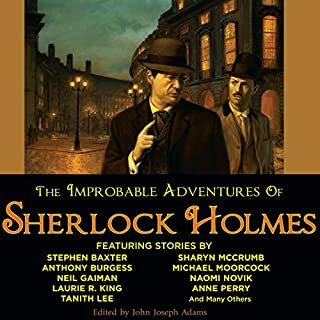 The narrator does an excellent job, and I would recommend this audiobook to anyone who loves Holmes, mysteries, or both. 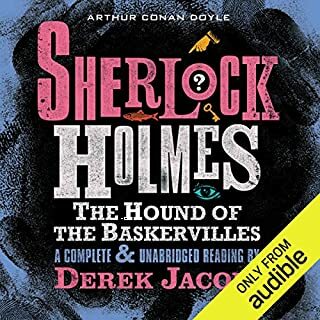 Although nobody could write with the complexity, snap and originality of the original Conan Doyle, this book is worth a listen if you are a ripper or a Sherlock Holmes fan. I have been a Sherlock Holmes fan for longer than I care to remember. While not a classic Holmes yarn, the overall "feel" of this story was close enough for me. I thought the writing captured the flavor of Holmes and the England of his time. In addition to a very good story, the narration was outstanding. What a difference an excellent narrator can make. I am not particularly a Sherlock Holmes fan, but I love Simon Vance and decided to try this. Lyndsay Faye writes very well, and this is a well-plotted book with a good deal of suspense and historical interest. Miss Monk is a terrific addition to the Holmes-Watson lineup. Vance is especially good here, giving full characterizations to everyone from Holmes to bit players. If you have any interest in the Holmes mysteries, you'll enjoy this tremendously, and even if you haven't, it's a very well done mystery. I'll definitely check out her other books. If Arthur Conan-Doyle had written a further Holmes novel this would be it! Atmospheric, tense and glorying in every detail beloved of followers of Holmes and Watson. Like a London particular the nuances of all that makes Holmes the master detective swirl around the reader and draw you in to the London of the 1880's. The plot is deep and although covering ground well known to students of 19th Century criminology Lyndsay Faye triumphantly holds the attention from beginning to end. My most enjoyable historical novel for a long time I only hope that further tales are forthcoming. What did you like most about Dust and Shadow? The story was absolutely fascinating, obviously well researched and based on many true facts from the Ripper case (post mortems, eye witnesses, police reports etc.) Above all, the ending was all too plausible. Loved it! What other book might you compare Dust and Shadow to, and why? There are other books (and films, games etc.) that pit Sherlock Holmes against Jack the Ripper, but without a doubt this is best story I've ever heard. I was gripped from beginning to end. The reading by Simon Vance was perfection. It didn't take me long to forget that there was just one reader, as he seemed to fully round out each character, both male and female. I have already listened to this twice and fully intend to listen to it again! Can't recommend it high enough. 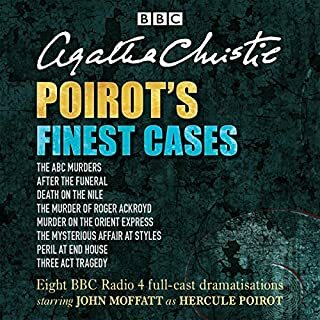 All I can say is that this book is fantastic, I have listened to and read and also watched most of the Sherlock Holmes media, this is very much part of the collection and a must listen for you. The story and the narration are superb. 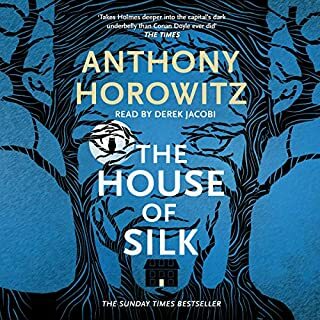 Loved this audio book which is a familiar story told from Dr Watson's point of view. It doesn't make him out to be a bumbling idiot either which is good. The narration is excellent and the story, although familiar, takes a different path. I recommend it. Brilliant. Account of the Ripper murders. A Very good fictionalised of account of the Jack the Ripper story. Extremely well written and an entertaining read. Provides a nice twist and a convincing explanation of the murders. This is very enjoyable. It's well researched about London. I HATE it when supposed historical fiction doesn't get London right. Don't want to be spoilery but I appreciate that this doesn't go for too sensationalist an identity for the Ripper. The author has neatly fitted the fictional detective around the historical facts without too much of an obvious join. I'm listening to The Complete Sherlock Holmes also narrated by Simon Vance at the moment so maybe that's why it seems to fit so perfectly with Conan Doyle's work and be convincingly Holmesian. Would you try another book written by Lyndsay Faye or narrated by Simon Vance? Yes. We'll written and best narrator, I have ever heard. Loved the old story. Had a lost week end listening to it. Has Dust and Shadow put you off other books in this genre? Who might you have cast as narrator instead of Simon Vance? Simon Vance is the best. He captured the characters perfectly. Does not suffer from the dry mouth and clicking tongue of some others. Loved him. If you could play editor, what scene or scenes would you have cut from Dust and Shadow? Enjoyed the story but maybe not for everyone as it Is about Sherlock Homes, Dr Watson on the trail of Jack the Ripper.